Originally found in dry coastal areas around the Mediterranean region, rosemary is now cultivated worldwide and is grown both as a culinary herb and for its essential oil. Medicinally, the herb is largely used as a stimulating digestive, nerve and circulatory tonic remedy, while the oil is used for arthritic pains. It is good treatment for low energy, low blood pressure and poor circulation. The herb improves memory, gives courage and lifts the spirits. A standard infusion can taste unpleasant, so use a weaker mix; Pour 1 cup of boiling water over 1–2 tsp (5–10ml). Take 1 cup for tiredness and headaches. Use a standard infusion, strained, as a final rinse for dandruff. Inhaling a drop of essential oil from a tissue is an energising brain stimulant and concentration aid. Take up to 50 drops/1/2 tsp (2.5ml) 3 times daily for tiredness and nervous exhaustion; combine with an equal amount of wild oat or vervain tincture for depression. Add 5 drops (1/4ml) of the essential oil to 1 tbsp (15ml) of almond oil and massage aching joints and muscles. Massage also into the temples to ease tension headaches. Use 1 cup of hot standard infusion in a compress to ease sprains. Alternating a very hot infusion with an ice pack every 2–3 minutes works best. The tincture, tea or even the fresh plant may be rubbed freely into areas of poor circulation. To gentle stimulate a weak heart, rub into the heart region of the chest. 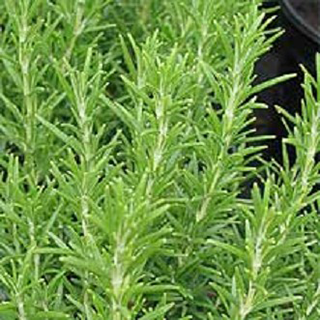 A rosemary bath is an excellent diaphoretic and circulation stimulant. Can be grown from seed, although cultivars do not come true and must be propagated from semi-ripe cuttings. Prefers neutral to alkaline soil. Gather in spring and summer.